I have finally done it! After numerous people telling me I should definitely read The Book Thief, I actually decided to listen and pick it up. I’ve heard so many good things about it, so to say my expectations were high.. Is probably an understatement? No, not true. I went in expecting nothing because.. me and reading historical fiction? Not that great of a combination.. It goes without saying that my favorite aspect of this entire book is the point of view of which Liesel’s story is being told. Death’s. It immediately gives a very, very different vibe to the story and I lived for it. I felt simultaneously drawn into the story, but still removed from it in a way as well. Definitely a unique experience and something I wasn’t expecting. That brings me to the main character of this story, Liesel. I adored how fleshed out her character was. I really felt like I knew her on a deeper level than “just a character in a book”, which is something I often find myself struggling with. It would be so easy to imagine Liesel actually existing in that time period. Her passion for reading, for books helped that along as well though. How could it not. We bookworms stick together, right? As for the writing.. Being a historical fiction, I was expecting myself to struggle reading The Book Thief and fortunately that wasn’t really the case. I didn’t fly through it, but I would still categorize it as a quick read – especially compared to other his fic’s I’ve read in the past. The addition of small notes by Death definitely helped and I loved how Zusak included some parts of the self-made books that are mentioned in The Book Thief. It added this extra vibe, or layer, to the story in general. But. 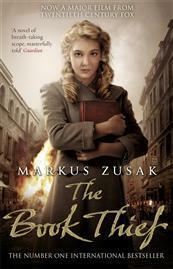 Even though I liked a lot of aspects regarding The Book Thief, I did end up feeling disappointed as well. So many people have been telling me it’s one of their absolute favorites. Not to mention how many said it’s such a tearjerker and “Oh! How I cried!” Being someone who isn’t.. that hard to get teary over a book.. I have to admit it’s a huge disappointment to discover you don’t feel like crying at all? I didn’t shed one tear? And I know it wasn’t me because I did cry when finishing the book I read before this one so.. Even though I enjoyed this book, I didn’t get consumed by it? I guess? Overall an enjoyable read, but I definitely won’t be saying this is one of the best books I ever read. Such a shame I didn’t get all the feels people kept talking about! What’s the last hyped books you read but didn’t fall in love with? Are there books you read that were supposed to be tearjerkers but didn’t feel like that at all to you? Next ›MAGICAL READATHON: CHRISTMAS AT HOGWARTS – Signing up and TBR! Really glad you liked this one, Kathy! ❤ Honestly, I didn't cry as much in this book as I *thought* I would. I think it's cause the ending isn't necessarily a surprise, so I already saw it coming? Not sure. Hahaha. Great review! I read this during a course on Holocaust literature, so when I read it I definitely cried big tears. I don’t know that it was the book or more that I was inundated with the historical nature of that time and the atrocities that happened. I will say that the book that tore at my heart the most during that course was “Sarah’s Key” that one was sadder. Wonderful review. I totally understand. I didn’t get all the feels when I read this either. I think how things are revealed before they actually happened left me a little detached from the book. Hm, that could definitely be it! Ooooh, great review. This is one I’ve also been meaning to read forever. I bought it during a kindle sale a few months ago and was thinking I might make it one of my challenge titles for 2019 just to finally get it off my TBR, but I’m also going into it not expecting very much. I love historical fiction buuuut I hear such mixed reviews on this one lately! It seems like one of those books that EVERYONE loved when it came out, but now that other authors in YA are doing WWII hist-fic, maybe this one isn’t as special as it used to be? I don’t read a lot of hisfic, so I can’t really say that other books influenced me in any way regarding this one. It’s just that I thought it was going to be a tear-jerker since people kept telling me that and then I felt like an emotionless robot for not even tearing up or something? :’) Death’s POV does make it a unique read though! So hopefully you’ll end up liking it anyway? Ah, i never cry on books 😂. Haven’t read this one yet. Definitely saves money on tissues, haha!